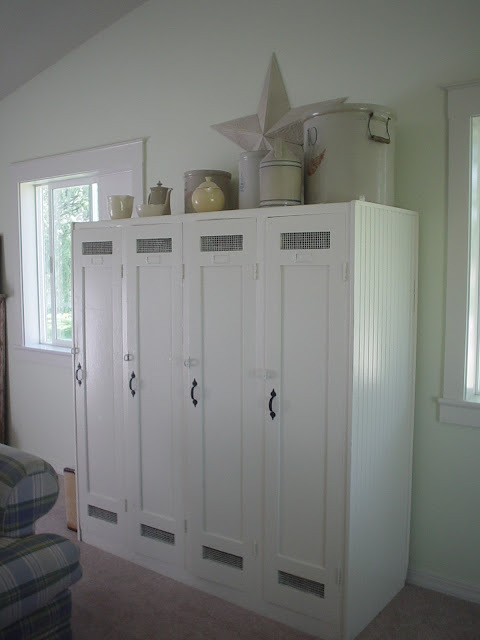 Look what Meridian Road uses to store her linens! Unbelievable! I wish these were MY lucky lockers! I would certainly feel lucky to have them. I completely adore them and am adding them to the WhisperWood Cottage Wish List. If anyone has a set or knows where I can get some, please let me know! They are on mine too! I emailed Suzanne at Meridian Road about them and she said her plan B was to build them but I'm not that talented. So, I did an internet search and found one set and they're just not as cute as hers (and they're expensive). She scored on hers. I'll just have to keep looking at hers and drooling. A set for you and a set for me?? I've been looking for lockers it seems like forever! These are fantastic! you and me both want those lockers! i saw these the other day at meridian and i was having' to wipe the drool from my jaw that was on the floor! they are certainly the coolest ones i've ever seen. SaWeet!!! Love these wooden lockers! I have a set of 5 old school metal lockers and I'm on task giving them a funky new look...can't wait till they're done! ....hahahahaha....Amy I had a cow just now when I spied these lockers....I thought WOW....MOVE OVER Amy's sliding door because I have a NEW Amy FAVE....But all is well in my world of FAVES & I'm off to visit Meridian Rose....THANKS for sharing....!! Oh my gosh!!! Love the wooden lockers! I haven't seen them before! Will keep my eyes peeled for the both of us! Those lockers are great...I can think of so many places to use one of those.